As of this writing the co-authors have interviewed 31 alliance managers from 29 big pharma, biotech, and animal health alliance management organizations. Some have longstanding alliance management practices and others are just getting started—20 percent of the interviewees’ companies didn’t have an alliance management function five years ago. Nearly all of them are adding alliance managers, and larger companies are creating new roles within their alliance management teams. 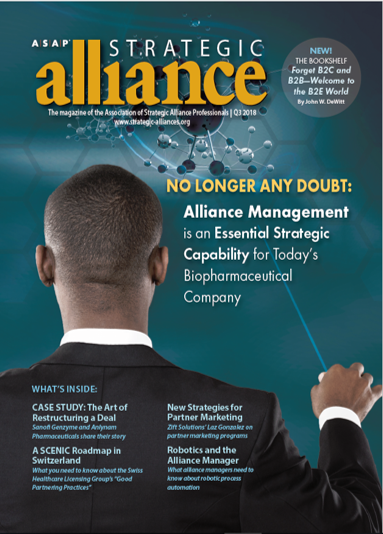 There is no longer any doubt: alliance management is acknowledged at the highest executive levels as an essential strategic capability in today’s biopharmaceutical company. Click on the link above to download the full article. You can also watch a webinar about the research and download our recommended roadmap for resourcing and developing your evolving alliance management function.